Now you can have hot and delicious Baked Potato Cheese Soup without the hassle of baking potatoes. It will be a family favorite for those survival days, camping days, or just emergency meal days. A favorite of everyone! Try adding ham dices, bacon crumbles, or vegetables for variety. This is a must have for your long term food storage staples. 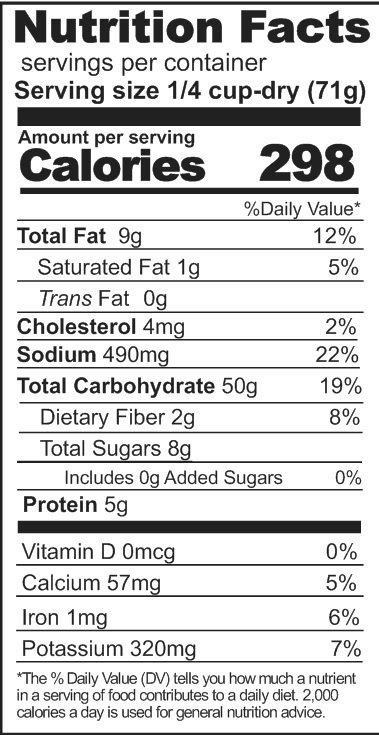 Ingredients: Potatoes, coconut cream (coconut oil, corn syrup solids, sodium caseinate (a milk derivative), dipotassium phosphate, contains 2% or less of mono and diglycerides, silicon dioxide), cheese sauce (whey, buttermilk solids, cheeses (granular and cheddar [pasteurized milk, cheese culture, salt, enzymes,]), whey protein concentrate, salt, sodium phosphate, citric acid, yellow 5, yellow 6, lactic acid, enzyme), dehydrated potato flakes, corn starch, chicken bouillon (maltodextrin, salt, chicken broth (dextrin, yeast extract, salt, potato flour, spices, yeast extract, natural flavor, salt, garlic, spices, onion powder, turmeric), luxor (hydrolyzed corn protein, sunflower oil), garlic, spice, dextrose, spices, xanthan gum, parsley flakes), spice, white onion, salt, celery, field run bell peppers. Baked potato cheese soup is a great soup to have on hand. This soup is great to have when their is a chill in the air. This is easy to cook up so it is great for a great easy meal. This is a delicious addition to your food storage staples. Directions: Mix the can contents thoroughly before opening (upside down & shaking). Remove oxygen absorber (do not eat!). For one serving: add 1/4 cup of mix and 1 cup of water in a pot. (May add more or less water for desired consistency.) Bring to a boil then turn down heat to simmer. Let simmer for 15-20 minutes or until potatoes are tender. Stir occasionally. Serve immediately.